When a city erupts in violent riots it gives us an opportunity to pay attention to the cause of the unrest and not just suppress it or wash it away with fire hoses. 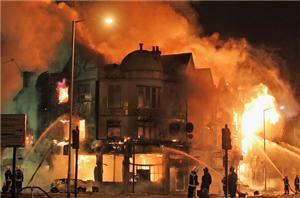 England is not unique in its riots; outbreaks of violence have occurred in major cities around the world. The different comments, about our riots, in the international papers gives an interesting world view (see The First Post), when our own view may be clouded and biased. Basically, our reaction seems to be one of embarrassment. The U.K. – one of the top international political voices – has been caught with issues in its own back-yard. Unrest, riots, demos and revolutions have different characters. Bubbles of unrest will always surface and disperse as a natural way of allowing the common voice to be heard. Demonstrations are, literally, the right of the civilian in a suburb to tell the central government how it feels. Revolutions happen when the government doesn’t listen, or doesn’t adjust conditions favourably, and when a tyrannical leader is left unchecked. But riots – wanton violence, pillaging, burning of property and man turning on man – is something more sinister. In the present riots there seems to be a single motive of anger and revenge for the shooting of a man by the police. (This case is untried and the circumstances are as yet unproven). Was it the real catalyst for unleashing so much anger and hatred towards the Law? What doesn’t make sense, is that the victim of this violence is the community itself; it isn’t common man fighting a cause for freedom, justice or compassion. To break shops open, threaten and hurt the shop-keepers, blatantly steal goods with no conscience and destroy property with fire, is madness. A demon seems to have been released – a demon that has taken its sustenance from a whole bunch of negative grapes (gripes). The People are not happy. I wonder what the true cause of this is. We have freedom of speech in this country, a good legal system, law-enforcement by an un-armed police force, plenty of food, water, work and social support – all the essentials for civil peace and democracy – so from what was this riot of anger and destruction born? Is it anarchy? A breakdown in family life? Drugs and alcohol abuse? Mass hysteria? Boredom? Violence under hypnosis? “The devil finds work for idle hands” – is still true. This riot has no moral banner and no obvious parallel with the struggle for human rights and political freedom seen in other countries. It reminds me of a very bad movie. Nevertheless, we cannot just blame those who have broken ranks, those with a brick in their hands; nor even the makers of mind-numbing, mind-controlling or mind-turning-to-violence media junk; nor the government, nor the global financial crisis. Maybe we should rise above the infected wound far enough to see the overall health of the entity itself. It’s not just London that’s in crisis – this is global. “It’s all in the mind” – is also true. What is created starts with what is in the thoughts. What is on the mind of The People? Where do The People put their attention and mind energy? Where are The People’s values – or what do The People value? Life on Earth is at a crisis point, with so many things wrong it is impossible to evaluate them or contemplate the subject, let alone the solution. Riots in London are no worse or better than the death and destruction everywhere – it’s all part of the same disease. And the cure? Away from the fires of destruction, there is another life, alive and kicking: it is the complete antithesis of all of the above. It is peaceful and loving, gentle and beautiful. It is lived by gifted, intelligent, kind and caring people, who create extraordinary things and look after themselves. It is healthy and strong and can be found all over the world. This other life is a part of the same entity that is wounded and sick, and it is the part that will survive. For news of this we have to look behind the headlines. It is always wonderful to see the surprising upside of horrors, and maybe fighting a common threat brings out the good in others and unites them. For every thug there are thousands of decent people. And even in some thugs, there is a glimmer of decency; but as in the story of the ‘Bad Samaritan‘ (BBC News), even those who would be expected to help each other, don’t, and worse – rob from those who have already been beaten. It shows how the leaders, the instigators of this bad behaviour are a rotten few, but many are drawn in and get caught up with it. In the few – the ‘bad apples’ – it seems all sense of decency has been overpowered by something else, something evil; but it spreads to the good apples and, one by one, they become rotten too. In the east, one comes across Kali. 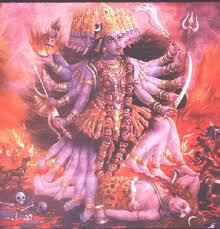 She is known as ‘The Destroyer’, or the ‘Dark Mother‘, yet she is a part of the Divine Mother, the Creatress. Kali knows right from wrong but she will fight like an aggressive warrioress, swords poised, ready to kill, when her angry thoughts see red. She turns the world towards the Dark, while holding the Light behind her. She can be seen in the eyes of those set to destroy, incensed by a mad rage in the battle with evil. Humans on Earth, are, apparently, falling from Grace: we started from a high and refined place and ended up here, in what the Hindus call the Kali Yuga. The Kali Yuga is the last of four ages or phases of involution during which Man has gradually lost awareness of his inner and subtle and higher existence. From a state of perfection and truth, Man has descended to the pits, where evil and dishonesty rules the day. All manner of destruction, selfishness and ignorance characterise this age – the one we are now in – because we are preoccupied with the materiality of everything. We are living in the darkest and densest phase of our evolution. The ancient schools of knowledge all knew this would come and the time-line of these Ages and Epochs has been described for our benefit – so that we know what is happening and what will happen next. It is also predicted that at the end of the Kali Yuga, Lord Shiva will destroy the world and all will undergo a great transformation. After this dissolution, Lord Brahma will recreate the world and man will become ‘Beings of Truth’ once again.